Happy first birthday Fashion and Cookies ! 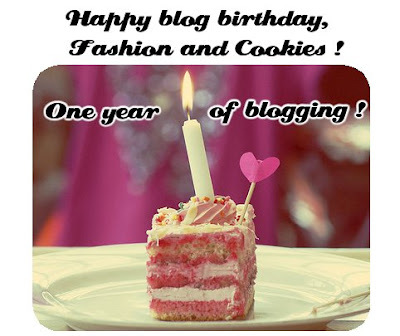 Time does passes by fastly...Today this blog is celebrating one year of blogging !. Exactly one year ago today, I launched this blog and was having my first, shy attempt of a post on blogspot. I initially posted in my first language only, italian, but I soon started to blog also in english (by the way, thanks for overlooking my grammar mistakes !) and I started also to post the pictures of my outfits...for a person very privacy concerned like me it was a pretty unusual and new thing !. In one year of blogging I've learned so many new things, met new extraordinary people and I keep learning every day. If this experience keeps being so positive it's mostly thanks to YOU, readers and followers, people commenting me and giving feedback. I used to keep a diary when I was a teenager, and also had scrapbooks with inspiring collages...but I kept all those things to myself, now it's so good to share them with other people from all over the globe and I am very thankful for each of my readers !. Of course, there's no birthday without presents, and I will be launching a special birthday giveaway to thank my followers for being there for me, as soon as the Zeleb giveaway ends (by the way, the Zeleb giveaway to win a party dress is gonna end on Wednesday 1st February, so don't forget to join it ! Click here !). You're welcome to follow this blog, as well as with Google Friend Connect, also on Facebook and with Bloglovin. I am happy if you follow me on Twitter and I have a brand new Tumblr that needs to interact with other Tumblr pages, so follow it with yours if you have a Tumblr and I won't forget to follow your Tumblr with mine, too ;-). Note: Google Friend Connect is soon not gonna work anymore on non blogger hosted blogs, it's not this case but if you are already following this blog thru Google Friend Connect and I am following you too and you wanna add also Bloglovin and Facebook, just let me know you added this blog also on Bloglovin and Facebook and I will do it too. Thanks again, sending a virtual slice of birthday cake to each one of you !. Buon primo compleanno, Fashion and Cookies ! Il tempo passa veramente in fretta...Oggi questo blog celebra un anno di vita ! Esattamente un anno fa ho lanciato il mio blog e ad un anno fa risale il mio primo, timido tentativo di post su blogspot. Inizialmente postai solo nella mia lingua madre, l'italiano, ma presto ho iniziato a scrivere anche in inglese (grazie se passate sopra ai miei errori grammaticali !) e anche a postare le foto dei miei outfits personali...per una persona fissata con la privacy come me è stato un bel passo avanti ed una cosa sicuramente nuova !. In un anno di blog ho imparato tante cose nuove, incontrato tante persone straordinarie e continuo ad imparare ogni giorno !. Se questa esperienza è così positiva è soprattutto grazie a VOI, lettori e followers, persone che commentate e mi date feedback su quello che posto. Quando ero una teenager avevo un diario e anche alcuni album di appunti e di collage che, però, tenevo solo per me...ora è così bello poter condividere i miei pensieri e le mie passioni con altre persone provenienti da tutto il mondo e sono molto grata per ognuno dei miei lettori !. Ovviamente, non c'è compleanno senza regali, quindi lancerò un nuovo Giveaway di compleanno non appena il Giveaway Zeleb finirà, per ringraziare i followers del blog ! (a proposito, il Giveaway per vincere un abito Zeleb finisce mercoledì 1 febbraio, pertanto non dimenticate di partecipare ! Cliccate qui !). Vi invito a seguire questo blog, oltre che con Google Friend Connect, su Facebook, e su Bloglovin. Sono contenta se mi seguite su Twitter e, inoltre, ho da poco un Tumblr che necessita di più Tumblr con cui interagire, per cui seguitelo se avete anche voi un Tumblr e non esiterò a seguirvi anche io ;-). Nota: Presto Google Friend Connect non funzionerà più per blog non ospitati su Blogger come questo, per cui se siete già followers di questo blog su Google Friend Connect e vi sto seguendo anche io e volete che ci seguiamo anche su Facebook e Bloglovin, fatemi sapere che seguite il blog anche su Bloglovin e Facebook e provvederò ad aggiungervi anche io. Grazie ancora, una fetta virtuale di torta di compleanno per ognuno di voi !. Tantissími Auguri per il tuo belissímo blog amica!! Also for me blogguing has been an amazing experience. Ho capito i anche siento tutto che ha detto qui. Happy 1st Birthday to you!! Thanks for the cake! Congratulations! That is so amazing you should be super proud! Wow! I can't believe you've only been posting a year. It seems like so much more doesn't it? Here's to many other years! Ti seguo solo da poco tempo, ma ho già potuto apprezzare la qualità di questo blog, di cui continuerò con molto piacere ad essere lettore e commentatore! Following you for a time with bloglovin... do you want to follow back with GFC or Bloglovin? Happy Birthday for Your blog Sweetty! CONGRATULATIONS!! ♥ Happy birthday to your blog! Happy one year of blogging! Have a great day! Congrats dear! :) That is so exciting! I love your blog, thank you for sharing your outfits and everything! Happy Blogiversary! This is so cool. Thank you for your visit on my blog and Happy birthay to yours :). I hope my blog 'll be, one day, as known as yours. Your blog is really sweet and lovely. Congratulations & happy b'day..hope you have a great weekend! congrats on a successful first year of blogging! oh my goodness...so exciting!! congrats, and HAPPY BIRTHDAY!! Thanks for your comment sweetie! I'm following you via bloglovin' and tumblr!!! happy birthday dear...may you be always inspired!!! congratulations, my dear! I wish you all the best for your further work on this awesome blog. Happy birthday to your blog - you've obviously had a wonderful year! Thank you for dropping in to mine and sending some love - made my day! I love your blog and am now following you. :) Fashion and cookies ... what could be better! Congratulations on your anniversary!! Such a big accomplishment. And look how far you've come! LOVE YOUR SHOES!!! WOW LOVE IT. Such a great style girl. Do you want to follow one another? happy blogaversary!!! oh, and i love your leopard dress + cardigan combo in your recent post! Hiya, thanks for the visit and comment!